Schezwan/Sichuan is Chinese style of cuisine originated from Sichuan Province in China, with its unique flavour coming from the Sichuan pepper. 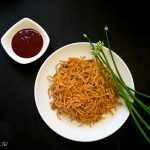 This recipe is modified to satisfy the Indian taste and so is a popular Indo-Chinese cuisine. 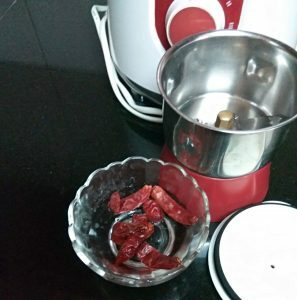 Soak red chillies in hot water for 10 minutes and grind to a paste. Finely chop all the vegetables and garlic. 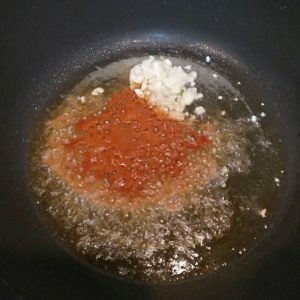 Heat a kadai with enough oil, add a red chilli, then chopped garlic. Fry just for a minute, now add the chilli paste.Give it a fry for minute over medium flame until the oil separates. 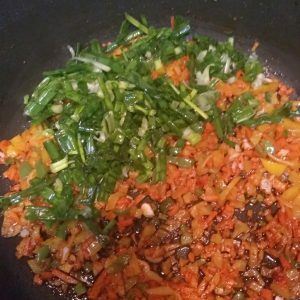 Add chopped capsicum, carrot and fry for 30 seconds in high flame, finally add spring onion.Stir fry for a minute over high flame. Stir quickly and add the cooked noodles. Add salt, chilli sauce, soya sauce, pepper powder.Toss well so that everything gets mixed up evenly. Adjust salt, pepper and add oil if needed. 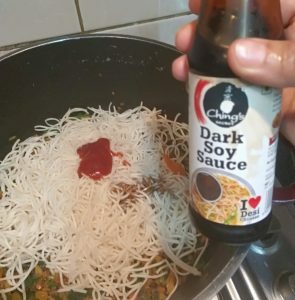 * Noodles should not be over cooked. Drain the noodles which will help to remove the starch from it and add 1 tsp of oil and keep aside. 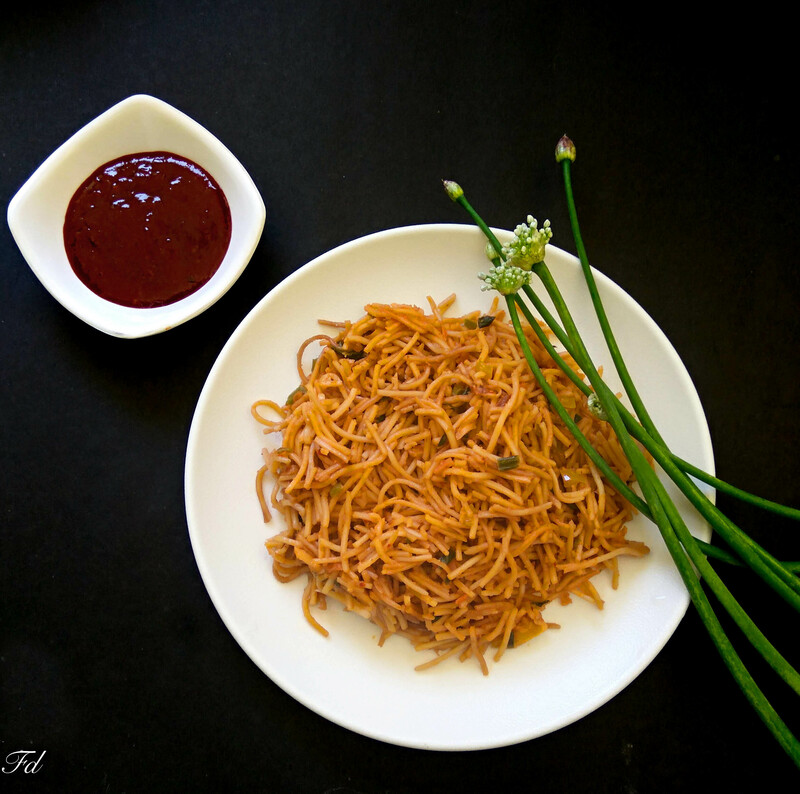 *Secret to get the perfect noodles – Toss the vegetables on high flame. Cook in small quantity on the larger burner in a large wok (if you don’t have wok use a kadai, make sure its not a heavy bottom one). *If you are planning to prepare for party and need large quantity . 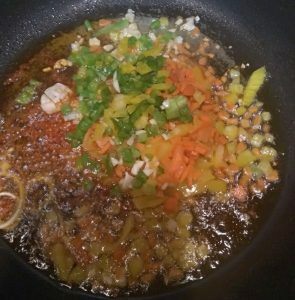 Cook noodles and chop vegetables. Take less quantity each time and Cook twice or thrice. You can do in the same wok . Cooking time will take only 10 minutes. 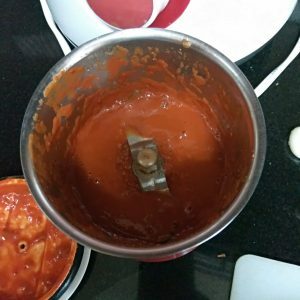 Soak red chillies in hot water for 10 minutes and grind to a paste. Finely chop all the vegetables and garlic. Heat a kadai with enough oil, add a red chilli, then chopped garlic. Fry just for a minute, now add the chilli paste. Give it a fry for minute over medium flame until the oil separates. Add chopped capsicum, carrot and fry for 30 seconds in high flame, finally add spring onion. Stir fry for a minute over high flame. 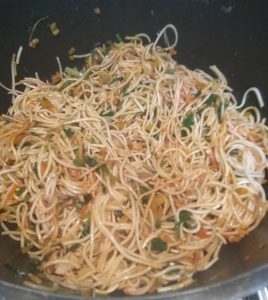 Stir quickly and add the cooked noodles. Add salt, chilli sauce, soya sauce, pepper powder. Toss well so that everything gets mixed up evenly. Adjust salt, pepper and add oil if needed.